salesforce.com, inc. (NYSE:CRM) investors should pay attention to an increase in activity from the world’s largest hedge funds in recent months. Our calculations also showed that CRM is also among the 30 most popular stocks among hedge funds, ranking 12th. Hedge fund sentiment towards the stock is also at an all time high right now. Let’s take a glance at the latest hedge fund action regarding salesforce.com, inc. (NYSE:CRM). Heading into the first quarter of 2019, a total of 99 of the hedge funds tracked by Insider Monkey were bullish on this stock, a change of 15% from one quarter earlier. 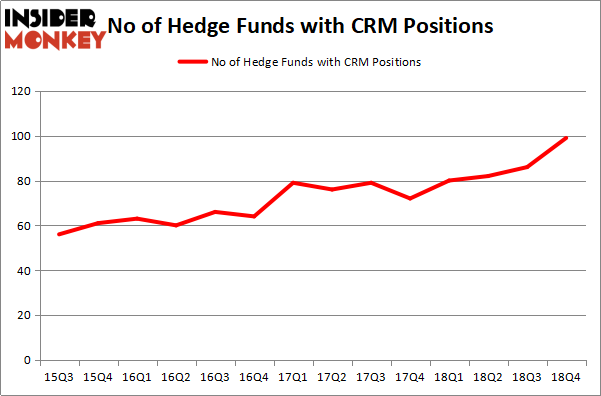 The graph below displays the number of hedge funds with bullish position in CRM over the last 14 quarters. With the smart money’s positions undergoing their usual ebb and flow, there exists a select group of key hedge fund managers who were boosting their holdings significantly (or already accumulated large positions). 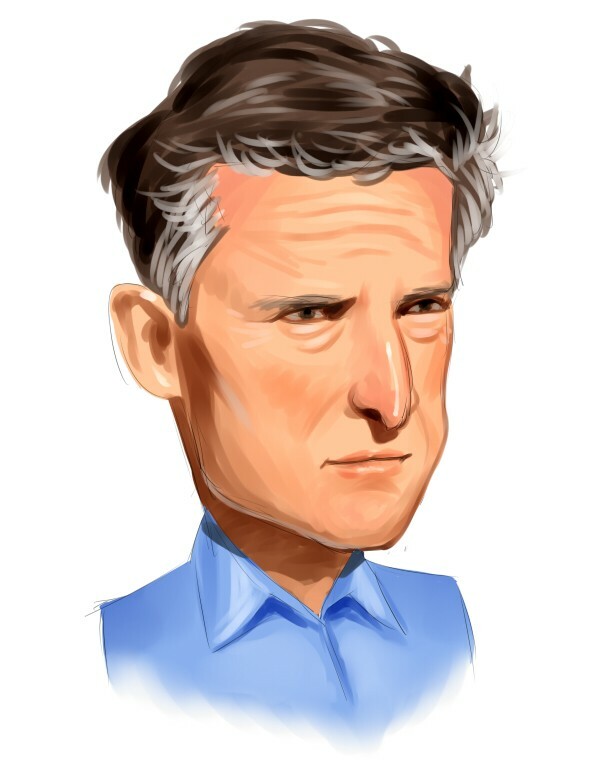 According to Insider Monkey’s hedge fund database, Viking Global, managed by Andreas Halvorsen, holds the number one position in salesforce.com, inc. (NYSE:CRM). Viking Global has a $708.8 million position in the stock, comprising 4% of its 13F portfolio. Coming in second is Fisher Asset Management, managed by Ken Fisher, which holds a $467.9 million position; the fund has 0.6% of its 13F portfolio invested in the stock. Some other professional money managers with similar optimism comprise Eashwar Krishnan’s Tybourne Capital Management, Chase Coleman’s Tiger Global Management LLC and Scott Ferguson’s Sachem Head Capital. With a general bullishness amongst the heavyweights, some big names have been driving this bullishness. Lone Pine Capital, managed by Stephen Mandel, initiated the most valuable position in salesforce.com, inc. (NYSE:CRM). Lone Pine Capital had $90.1 million invested in the company at the end of the quarter. Hari Hariharan’s NWI Management also made a $34.2 million investment in the stock during the quarter. The following funds were also among the new CRM investors: Leon Shaulov’s Maplelane Capital, Robert Pohly’s Samlyn Capital, and Anand Parekh’s Alyeska Investment Group. Let’s also examine hedge fund activity in other stocks – not necessarily in the same industry as salesforce.com, inc. (NYSE:CRM) but similarly valued. We will take a look at Philip Morris International Inc. (NYSE:PM), Broadcom Inc (NASDAQ:AVGO), International Business Machines Corp. (NYSE:IBM), and Union Pacific Corporation (NYSE:UNP). This group of stocks’ market values are closest to CRM’s market value. As you can see these stocks had an average of 50.75 hedge funds with bullish positions and the average amount invested in these stocks was $2708 million. That figure was $5078 million in CRM’s case. Union Pacific Corporation (NYSE:UNP) is the most popular stock in this table. On the other hand Philip Morris International Inc. (NYSE:PM) is the least popular one with only 48 bullish hedge fund positions. Compared to these stocks salesforce.com, inc. (NYSE:CRM) is more popular among hedge funds. Our calculations showed that top 15 most popular stocks among hedge funds returned 19.7% through March 15th and outperformed the S&P 500 ETF (SPY) by 6.6 percentage points. Hedge funds were also right about betting on CRM as the stock returned 17.9% and outperformed the market as well. Here is What Hedge Funds Think About AutoZone Inc. (AZO) Here is What Hedge Funds Think About BT Group plc (BT) Hedge Funds Dropped The Ball On Fortive Corporation (FTV) Is IQVIA Holdings, Inc. (IQV) A Good Stock To Buy? Were Hedge Funds Right About Souring On Canon Inc. (NYSE:CAJ)? Were Hedge Funds Right About Flocking Into Sempra Energy (SRE)?